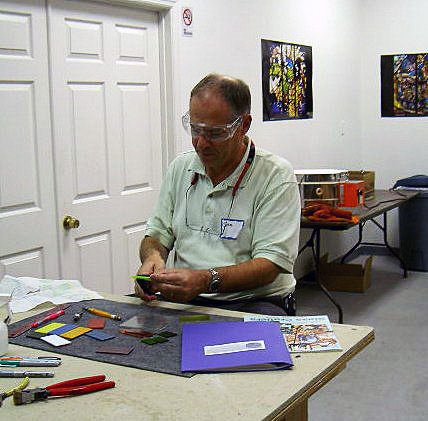 Learn the art and craft of kiln-worked glass in this exciting, ONE DAY, intensive beginner’s class! Pippa (“Pip”) Cossette of TWO LASSES GLASS CLASSES, will share her passion for glass fusing in a ONE DAY class that will teach you ALL the basics! Classes are conveniently held at our private studio just off US 41, at Glengary Street (the first intersection south of Bee Ridge Road) in Sarasota, Florida. 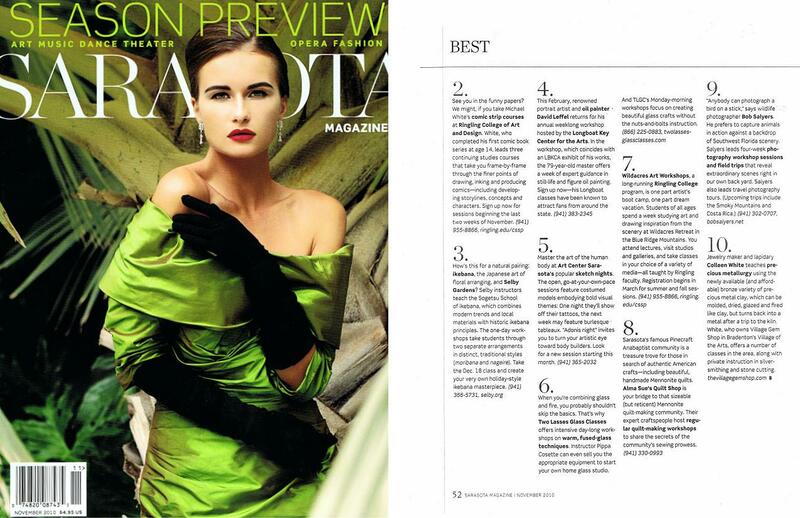 Touted by Sarasota Magazine as one of the TEN BEST CREATIVE ART CLASSES in Sarasota, budding art glass enthusiasts will learn about the process of glass fusing, from cutting and designing to kiln preparation, firing schedules, annealing, fire polishing and glass compatibility. A real time kiln-firing is part of this informative hands-on class! 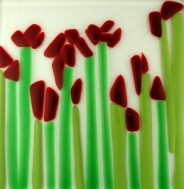 Each student will create TWO fabulous fused glass tiles to keep and enjoy, or to give as gifts. No previous experience is necessary. Create beautiful trivets just like these! 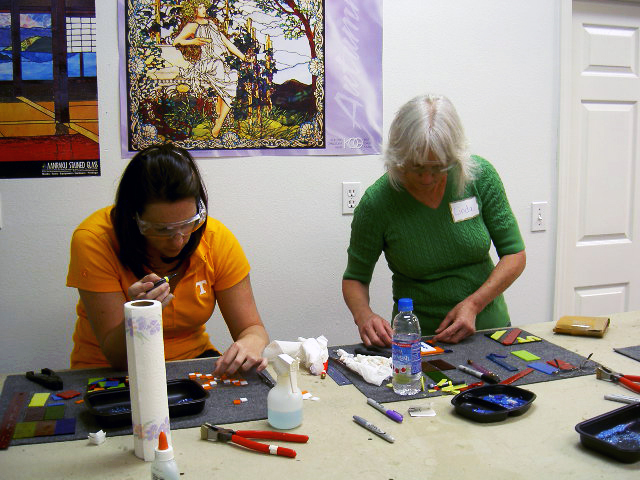 The class fee is $200.00 and includes ALL the necessary supplies (i.e., glass), use of the tools and equipment and the firing of your pieces. Classes begin at 9:30 AM and end at approximately 4:30 PM. Refreshments and snacks will be provided by the Lasses. Students are asked to bring a bag lunch. There will be a limit of TWO students per class. 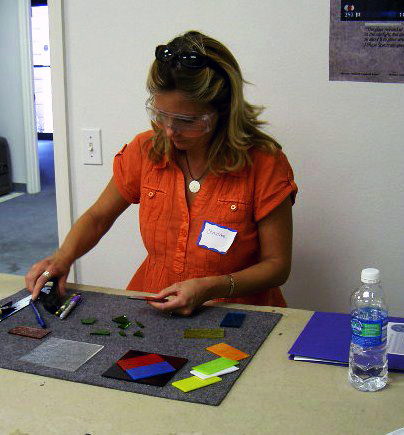 To register for our Fusing for Beginners class, please e-mail twolassesglass@yahoo.com or call (941) 923-3773 and leave your name and number so we can get back in touch with you regarding a mutually convenient date to schedule your class. You will be making a $75.00 deposit* to register for a class and the balance of the fee will be due on the date the class is taught. Our business office is located in Sarasota, on Florida's beautiful Gulf Coast. *Deposits reserve your place in our studio and ensure that classes are not over-booked. Your deposit is fully refundable if the class is canceled, or you may choose to use that same deposit to hold your place in the next available class. Students who find themselves in an unavoidable situation where they need to cancel (i.e., illness), will automatically have their deposit used to hold their place in the next available class.